Google has just presented their latest project that will provide internet to the whole world. Although Internet seems to already be world spread, two-thirds of world´s population is still not connected. Google plans on creating a network of ballons travelling on the edge of space to connect people in rural and remote areas, to fill connectivity gaps, bring education, and find people online after disasters. 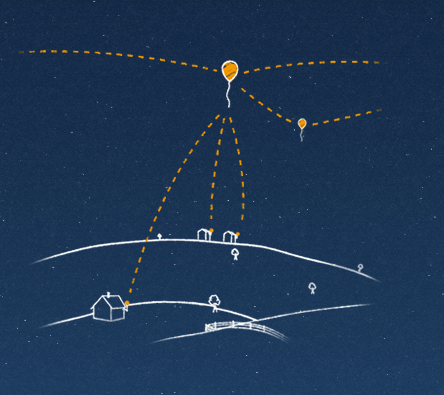 Google: Project Loon balloons float in the stratosphere, twice as high as airplanes and the weather. They are carried around the Earth by winds and they can be steered by rising or descending to an altitude with winds moving in the desired direction. People connect to the balloon network using a special Internet antenna attached to their building. The signal bounces from balloon to balloon, then to the global Internet back on Earth. The first test ballons will be sent to outer space this month (June 2013) from the coasts of New Zealand, and tested by local pilot testers. The test will help refine the technology. This entry was posted on June 17, 2013 by mcquant in News and tagged Google, internet, Loon, Project Loon, Wi-fi.